This is more than just a book... This is a revolutionary and 100% natural approach to hypothyroidism, complete with a step-by-step guide that walks you through the process of restoring your thyroid health. It's based on the latest scientific breakthroughs in hypothyroidism, diet, and hormone research. I feel great with lots of energy, no more fatigue and tiredness, no more swollen neck, no more afternoon energy crash, no more dry and gritty eyes,no more loss of stamina, no more trembling or shivering feeling, no more cold sweats, no more waking up feeling unrested, my hair loss is improving, no more blurred vision,no more sensitivity to loud noises, no more joint pain and stiffness,no more back pain,no more depression,no more easily upset, no more light headedness,no more loss of motivation,no more nights sweats, no more dry skin, i can feel the change on my body and is wonderful as you say I'm on top of the world, i can't find words to thank you for all your support that you give me. I have enjoyed learning about my hypothyroidism that I obviously inherited from my mother, grandmother, great-grandmother. The difference being: I do not want to start Synthroid and be on it for the rest of my life the way they were! I have been working my way into your plan for about 6 weeks now. ALL of my symptoms have improved! I'm not cold all the time. My energy level is through the roof! My emotions have leveled out. I've lost 15 pounds. The list goes on and on. This is just a brief note of gratitude for the knowledge you are sharing with others. I've looked for this information for years. I have fought thyroid ups and downs for the past 9 years. I've seen my family doctors, an endocrinologist, and a chiropractor in hopes of some "natural" help. I've been taking Armour Thyroid now for a year and have seen ups and downs with it until 10 weeks ago when I discovered your website. Honestly, I was extremely skeptical...but, I and my insurance have spent thousands of dollars with no real benefit. I seem to now be on my way to real healing! I noticed a difference in just ONE week of beginning your program. I am feeling so much better both inside and out. 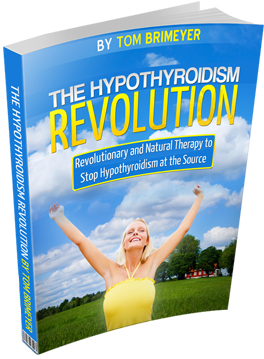 Start Feeling Like Your Real Self Again By Taking Advantage of the Latest Breakthroughs in Hypothyroidism, Hormone, and Diet Research.